Who knows this new single line kite from Skyburner ? What is it's price and where is it possible to buy it ? Kites and Fun Things, it's linked off the Sky Burner site, that's Jon's retail outlet. It's a pretty cool kite, big, and flys in most any winds. Original design by Ceewan, there's a video somewhere of Jon & Marieanne flying a couple but I didn't find it in a quick search, here's one of Ceewan, the Sky Burner version doesn't fold up the bottom fabric like this one does. It's big, pretty and fairly stable. Don't know the price. I asked Jon by e-mail and he told me $750. But perhaps less by ordering by GWTW ? Steve, r u there ? I got one - it's big and it is awesome. 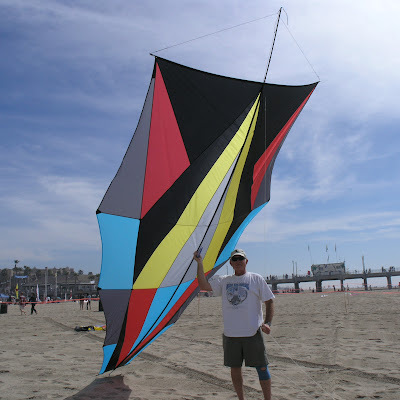 The kite has no bridle and rolls up to fit in a normal kite sleeve just like my duallies. This thing flies in winds starting around 3 mph and will stay up in the air like an anchor all the way to 20mph. He had a new version of it at KP that looked like an alien face. I think the Godfather has some pictures in his small KP collection on Picassa. the one shown at kite party is also larger which may account for the price increase. Jon said he's working on an even bigger one than he had up at KP8. He's got the show kite bug, I think.